First people in Okinawa has been dominated by Japan & U.S. governments. This is a historical record of a struggle for New U.S. Military base construction in Henoko. Earth Quake and Tsunami took about 20000 lives. And Nuclear disaster continues to lead us to the unkonwn future. Many differnt theories has been expressed about a radiation matter. Some of them says Radiation in Fukushima is not danger to our body. Some of them says that there are already many victims of Radiation. People in Fukushima are not feel free to speak about radiation issue. The government & media put more weight to talk about safety of radiation. It make me think that how we the people live out side of Fukushima support. At Southern Minami Soma city where recently J.P. government permitted to live after Nuclear contamination. March 10th. Inter faith pilgrimage has been held past 7 yeras. Tsunami reached a couple of miles. Elementary school was engulfed by Tsunami. A woman from Hokkaido visits every year on this week. Offering a wooden stupa for spirits. A dose meter at park. Hundreds of kms continue a wall of concrete. For preventing another Tsunami ? or for profits of corporations ? I understand this walls are symbol for fear and ignorance of human being. It's a historical monument of Human Creation. Pref. Gov. J.P. Gov. Local Media campaign about safety about radiation. This year, the rally was smaller then ever before. We worry about speaking radiation issue is becoming a Taboo in Fukushima. Miyagi Pref. Onagawa Nuclear Power Station. Ibaraki Pref. Tokai Nuclear Power Station. 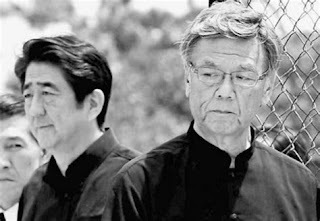 Na Mu Myo Ho Ren Ge Kyo.Many thanks for your great effort for Fukushima and Okinawa. You were on an excellent TV programme on British Television. Take care of your health. My best wishes to your Mother. Okinawa Prefectural Referendum for Henoko New Base will be held on 24th Feb. 2019. The Referendum is about U.S. Marine’s Base construction. I have a strong desire that all Americans to get to know about OKINAWA’s issue. Here, I give 3 reasons why I oppose U.S. New Base in Henoko. NO1, I moved to Okinawa 5 years ago. I lived in Tokyo until 18 years old. I had never thought about U.S. Military Base issue of Okinawa. However, I traveled to Okinawa twice, when I was 12 and 18 years old. A purpose of travel was “Beach & Resort”. I didn’t have an any interest about U.S. Base issue and even a history of a battle of Okinawa during my travel. As I was a one of the majority Japanese who don’t think about Okinawa Issue. So, I know how much Japanese main landers don’t know & don't care about Okinawa. In schools, with friends, and even with a family, I had never discussed about Okinawa issue. Thank you ... Governor Onaga. We will not forget your dedication to Okinawa. Okinawan governor Onaga past away on 8th Aug. He had a pancreas cancer. He was given surgery this April. If he gave up his job at that point, he 'd may be survived up to now. His responsibility was so much to Okinawa. He was an one of the most powerful gorveronor in Okinawan history. He was a member of Liberal Democratic Party(LDP) which is the biggest political party in Japan. Priminister Abe is the top of LDP. However, when Mr. Onaga saw how Japanese goverment treat Okinawa, He decided to leave from LDP. And Mr. Onaga ran for Okinawa governor and He was elected. What was a special about a governor Onaga is uniting Okinawan conservatives to stop U.S. military eapansion. U.S. mlitary issue in Okinawa was always devided conservative party and liberal party. However, Mr. Onaga joined the hands with liberals to stop new U.S. base expansion. He said, No More Ideology But Identity. Everyday life in Okinawa is next to military. Everyday Life in Okinawa is a fight to stop Military's brutality. Over 70 years. Okinawa is the strongest peace movement in Japan.